Inspect trees that appear weakened by drought. In high winds, downed trees and branches can damage homes, vehicles, and power lines. Have roof repairs made and other leaks fixed. Clear gutters of leaves and other debris. Prepare a disaster supply kit and have an emergency plan for your family. Consider flood insurance. Homeowner's policies typically do not cover flood damage. Most flood policies require a 30-day waiting period. Avoid walking or driving through flooded roadways. Just 6 inches of moving water can knock you down and 2 feet of water can sweep away a vehicle. Visit http://tadd.weather.gov/ for more flood safety tips. The City of Orange has free sandbags and sand available at the Water Department located at 189 S. Water St. Sand to fill bags are provided on a first come, first served basis between the hours of 7:00am-5:30pm Monday through Friday. There is a limit to 10 bags per residence in the City of Orange. Halloween is the beginning of an exciting and festive holiday season, which should be full of treats. Below are some safety tips you should remember. Accompany children on their Halloween route. Walk on sidewalks and cross the street safely. Carry a flashlight or glow stick to be visible. Apply reflective tape to the front and back of the costume so your child will be visible to cars. Use face make-up instead of a mask so children can see easily. Make sure to stay at the door of a home and never go inside. As the days become shorter, it's a good time to check your exterior lights to ensure they are in good working order. Replace bulbs that are not working and reset all lighting timers to turn on earlier in the evening. In your yard, trim any bushes or shrubs that have excessive growth from the summer season which may be shielding doors or windows from view. Recently a citizen observed two subjects running through a green belt area away from the backyard of a residence. The citizen saw the two subjects were carrying backpacks and watched as they entered a pick-up truck. The citizen wrote down the vehicle's license plate number and reported his observations to the police department. Officers confirmed the residence had been burglarized and detectives quickly followed up on the lead. Detectives arrested four subjects from the Inland Empire area and recovered the victim's property. The subjects admitted to their involvement in the burglary and to committing other similar crimes. This is a reminder to remain vigilant in your neighborhoods for suspicious activity. Oftentimes, crime is prevented by identifying suspicious persons who might be engaged in criminal activity. If you see a person or a vehicle that is unfamiliar or appears without purpose in your area, do not hesitate to call the Orange Police Department at (714) 744-7444 or 911 for an emergency. Your assistance in helping us stop crime is always appreciated. As temperatures increase many residents like to leave windows and doors open for ventilation. Please be mindful that residential burglars access homes through open or unlocked windows and doors. The majority of these burglaries are occurring during daytime hours, although some have occurred during early evening times. Be a good neighbor and report all suspicious activity. Keep your doors and windows locked even when leaving your home for short periods of time. Secure your side gates and garage side doors. Keep outside lighting on during hours of darkness. Maintain landscaping to prevent hiding places. Secure valuables inside your home. HAVE A ZERO TOLERANCE FOR SUSPICIOUS ACTIVITY, WHICH INCLUDES UNKNOWN VEHICLES AND PEDESTRIANS WHO ARE LOITERING IN THE AREA. Immediately report any suspicious activity by calling the Orange Police Dispatch at (714) 744-7444 or 911 for any in progress crime or emergency. Thank you for your help in keeping the City of Orange safe. The Orange Police Department needs your help in having zero tolerance for suspicious activity. Please report any suspicious activity by calling the Orange Police Department at (714) 744-7444 or 911 for any in progress crime or emergency. We are experiencing a number of residential burglaries in the City of Orange occurring when doors or windows are left open or unlocked. Immediately report any suspicious activity by calling the Orange Police Dispatch at (714) 744-7444 or 911 for any in-progress crime or emergency. If someone knocks on your front door and you don't know them. If you see unfamiliar people knocking on your neighbors' doors. "Door-knock" or "solicitor" burglars have been spotted in Orange. They sometimes pose as solicitors or service technicians and knock on the front door to see if anyone is home. When nobody answers the door, the thief will look for a back door or window to break into the home. Unlocked doors and windows only make it easier for the burglars! Some suspects have even driven high-end vehicles during their crimes to blend in to our nice neighborhoods. Let people know you are home. Thieves usually break into unoccupied houses. Lock all your doors and windows when you leave, even if it's only for a few minutes. If you see someone knocking on doors in your neighborhood, call the Orange Police Department immediately at (714) 744-7444 or 911 for any in-progress crime or emergency. Report any suspicious activity immediately by calling the Orange Police Department at (714) 744-7444 or 911 for any in-progress crime or emergency. Do not report any in-progress crimes via i-Watch. We are experiencing a number of bicycle thefts in the City of Orange occurring when they are left unattended or garage doors are left open. Write down your bicycle serial number and keep it in a safe place with a photo of the bike to ensure proper identification if it is recovered. Additionally, the Orange Police Department will license your bicycle at the police station (1107 N. Batavia St.). This could help law enforcement return the bike to you in the event of its recovery. If your bicycle is stolen, remember to include the serial number in the crime report to the police department. Call the Orange Police Department at (714) 744-7444 and file a report of your bike theft as soon as possible to get the serial number into the system. Report any suspicious activity by calling the Orange Police Department at (714) 744-7444 or 911 for any in-progress crime or emergency. Like many cities throughout Orange County, the City of Orange has been experiencing thefts of catalytic converters from vehicles. Catalytic converters are not serialized making it very difficult for law enforcement officers to identify who the victim is and return the property to its rightful owner. Engraving an ID number on a catalytic converter gives you a chance at recovering stolen items; it also warns potential thieves that your property is traceable by law enforcement. Typically, catalytic converters are stolen from cars and trucks in driveways, strip malls or in parking garages. The most commonly targeted vehicles are SUVs and trucks since the converter is easily accessible. Have the converter welded onto your car - To prevent thieves from stealing your catalytic converter, you could have your mechanic weld it on. The main drawback is that, should you ever need to have it repaired or replaced, it will be more difficult to remove and possibly cost more for labor. Park strategically - When out running errands, park in well-lit areas close to the door. If you park in your driveway, consider installing a motion spotlight over your vehicle and back your car into driveway. Invest in a lock - Invest in a specially devised lock that secures your converter, and you could save yourself time and money in the long run. A few versions exist and can cost anywhere from $100 to $150. Many come with a warranty against theft as well. Report any suspicious activity by calling the Orange Police Department at (714) 744-7444 or 9181 for any in progress crime or emergency. Recently, the Orange Police Department has been made aware of a scam involving a taxi cab driver who is showing up at residences. The cab driver states they received a call, from a third party, to respond to your residence. After making contact with the resident, the driver will call the person who supposedly made the call on your behalf, and ask you to talk to the person on their telephone. The person on the telephone will advise you to pay the driver for the inconvenience of having the cab respond to your residence. Please contact the Orange Police Department if you have experienced a similar incident(s). If you are contacted by a taxi cab driver, requesting you pay for services you did not request, please call the Orange Police Department immediately at (714) 744-7444. If possible, please note the full name of the taxicab company, telephone number, and the driver's full name. At no time can the driver charge a customer a fee for simply responding to a reserved dispatch call. Once the passenger is picked up, the driver activates the meter and the customer pays the amount shown on the meter upon arriving at their destination. This protects the customer from being overcharged or being defrauded. Between August 1 and September 15, there's been an ongoing crime trend of property crimes in two Southwest areas of Orange. In the area of S. Olive and S. Lemon, and the 100-700 block of W. La Veta, there have been several residential and vehicle burglaries in the last six weeks. Also during the same timeframe there were residential and vehicle burglaries along 2000 - 2100 W. Palmyra Avenue, and 1800 - 2000 W. La Veta Avenue. The majority of these crimes occurred during the daytime. Recently, there has been a series of residential burglaries in the City of Orange. The suspect(s) are accessing homes through windows or sliding doors left open for ventilation. These burglaries have occurred on weekdays during daytime hours when residents are not home. Residential burglaries are crimes of opportunity occurring when doors or windows are left unlocked or vented. Immediately report any suspicious activity, to include somebody soliciting door to door in your neighborhood by calling the Orange Police Dispatch at (714) 744-7444 or 911 for any in progress crime or emergency. There has been an increase of theft from mailboxes. Suspects are targeting mail that contains payments earmarked for creditors such as mortgage lenders, credit card companies, financial institutions and retail businesses. The thefts occurred after the victims put outgoing mail into their mailboxes in front of their homes. When possible place outgoing mail into an official USPS collection box or give it directly to your letter carrier. They are hard to break into, in a more public setting, and postal employees monitor them at pickup times. Be actively aware of mail theft in your neighborhood; watch for thefts in progress and report them immediately by calling 911. Shred all mail going into your garbage that contains your name, address, or other vital information. Always report suspicious activity by calling the Orange Police Department at (714) 744-7444 or call 911 for emergencies. 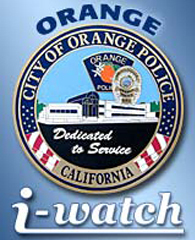 In an effort to raise awareness regarding criminal activity occurring adjacent to the city of Orange, we are issuing this i-Watch bulletin. The city of Tustin has reported they are conducting an investigation into an incident of child annoyance which had occurred on Wednesday, 06/01/2011 at 7:11 PM. According to the Tustin Police Department, two children, ages 10 and 12, were playing in their front yard of their home, which is located approximately one block away from Benson Elementary School (cross-streets being Winsor and Elizabeth Way). During this time, a white van, described as "boxy" with tinted windows on the sides and rear, stopped in the middle of the street and motioned the children to the van. As the children approached, the male driver said, "Hey, get in, get in." The children were frightened by the encounter and immediately ran home before the suspect van sped away. The suspect and driver of the vehicle was described as a male Hispanic in his mid 40's with dark "buzz cut" hair. He was additionally described as clean shaven and wearing a white shirt. A passenger within the van was described as a female Hispanic, 40-50 year old, with long brown hair while wearing a white shirt. Recently, there have been thefts of 2007 GMC 3rd row seat throughout the City of Orange. The thieves are targeting late model Chevy, Cadillac, and GMC full size SUVs and stealing the 3rd row seat. The seats are made to easily remove and are a valuable addition to these SUVs. If you have a neighbor or friend who owns a full size SUV, please share this important message with them.